You can help to prevent various fly infestations from occurring in your home or business through sanitation methods and effective pest control. When you think of a fly, the typical house fly comes to mind, but what you may not know is that there are several varieties of flies that can inhabit your home or business. Below are a few examples of common flies and their distinguishing features, as well as some techniques that can be used to prevent them from invading your home or business. Cluster flies are similar in size to house flies (3/8 inch), but are more robust in body structure. Depending on the weather and region, cluster flies primarily enter homes in Mid-August to early December and can be seen “clustering” around warm spots in the home, usually around a window or in an attic space. They can also be found in wall voids. Cluster flies in the larval stage feed on earthworms and adults feed on plant nectar, unlike house flies or fruit flies, that tend to prefer decaying food sources. Once temperatures drop, cluster flies begin searching for warmer shelter for hibernation, typically in buildings and homes, where they neither breed nor eat, but will await the warm spring weather. On warm days in the winter and spring, cluster flies may become active and crawl sluggishly over walls or windows. How do I Prevent Cluster Flies from Invading my Home/Business? There are a few simple ways that you can help to prevent cluster flies from entering your home or business. The first is making sure that entry points are sealed off properly and that any holes in window or door screens are repaired. Secondly, if you have any cracks or openings on the outside of your home it is recommended that you seal them up with a silicone based caulk. When a cluster fly has been killed in your home, either vacuum it up or dispose of it properly, as their carcass will attract beetles and other insects. After sealing your home as best as possible, it’s recommended that you call in a licensed pest management professional (PMP) to service the outside of your home or business. 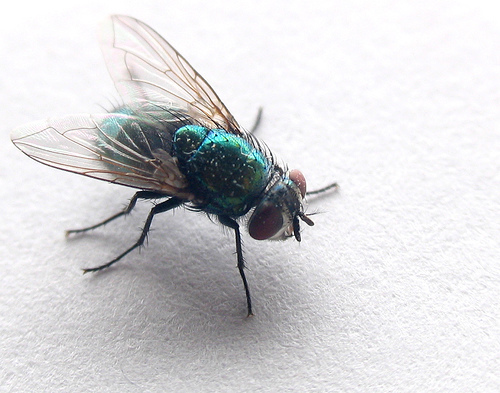 There are two common types of flies typically found in the home, the traditional house fly and the bottle fly. The house fly is usually dull grey, while the bottle fly is distinguishable by its metallic blue, green or yellow-brown sheen. These flies feed on a range of items from human food to decomposing organic matter such as feces and garbage and they’re a significant health concern because of the many filth-related diseases they carry. For a restaurant owner, fly infestations can result in a public relations nightmare, and in more severe cases, business closure. How do I Prevent House Flies from Invading my Home/Business? 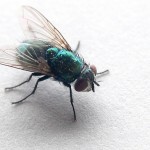 While it is nearly impossible to prevent house flies from entering your home or business, there are a few things you can do to help prevent them from multiplying. The first and most important thing that you can do is keep your home or business clean. This includes cleaning with a disinfectant, taking out the garbage and disposing of anything organic that has been sitting out for an extended period of time. If you notice that there is an overwhelming amount of flies in your home or business, it is recommended you call a PMP to provide an inspection before it becomes a major concern. Fruit flies are distinguishable from the common house flies and cluster flies in that they are smaller and commonly found circling around overripe or rotting fruit. These pests can be a big problem for restaurants and businesses as they not only develop in over-ripe fruits or vegetables, but are also found in fermenting liquid in the bottom of garbage cans or on a dirty mop, as well as recycling bins and fruit and salad bars. How do I Prevent Fruit Flies from Invading my Home/Business? Fruit flies can enter a household or business on a piece of fruit or vegetable from a grocery store or through an open door or window in the kitchen. Keeping your house or business clean and sanitized and throwing away overripe and rotting fruits and vegetables will help ensure that fruit flies do not invade your space. If you are an owner of a business and notice that there is a large amount of fruit flies in your establishment, it is recommended that you call a PMP to survey the problem before the infestation becomes overwhelming. Moth or drain flies are very small “hairy” flies measuring about 1/16 to 1/4 inch long and are often a problem for restaurant owners when they breed in liquids found in kitchen drains, dirty garbage containers and septic tanks. These flies reproduce in the drains and pipes and even a small coating of organic material or buildup will harbor this pest. How do I Prevent Moth Flies from Invading my Business? Moth flies can easily be prevented by keeping your restaurant or business clean and sanitized and ensuring that your drains are clear of any organic material and debris. If you have an infestation, do not pour bleach down the drain, as this will not remedy the fly concern and can damage the drains and pipes, causing an even larger problem. Instead, contact a PMP who can offer advice on ways to rid your pipes of the fly, including the use of an enzymatic cleaner that will break down the organic build up these flies harbor in. Ensuring that your home or business is clean is the first and most important step in fly control. Whether you’re dealing with cluster flies, house flies, fruit flies or moth flies, you can help prevent infestations with the proper cleaning techniques and fly management. However, do-it-yourself fly control is often not enough and may only provide a short-term fix. For a more permanent solution, it’s best to partner with an experienced pest management professional who will evaluate the situation, find and eliminate breeding materials, offer effective preventative methods, including sanitation products, set up proper bait traps and equipment and monitor results. If you’re dealing with fly issues in your home or business, Modern Pest Services can help. Give us a call at 1-888-997-3312.